So the last post discussed the discovery of Yersinia pestis, the bubonic plague bacterium during an outbreak in Hong Kong in 1894. You might be wondering how they knew they had the correct organism. 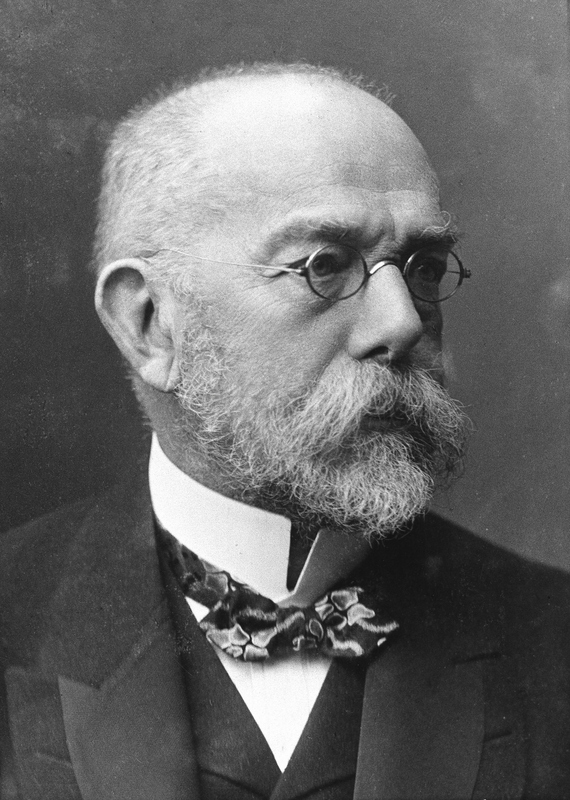 Both Yersin and Kitasato worked at one time or another with Robert Koch in Germany. Koch is considered one the Fathers of Bacteriology, the first to not only devise a method of obtaining a pure culture but with his colleague developed the Petri dish and culture media still used today. Koch skyrocketed to scientific fame as the one who proved that Bacillus anthracis is the cause of anthrax, then a common livestock disease in Germany. Koch was the first person to culture anthrax discovering bacterial endospores and a new method of bacterial transmission in the process. He went on to do groundbreaking work on tuberculosis and cholera. Koch spent his last years in a frustrated search for an effective tuberculin vaccine, which is still elusive today. While his tubuculin vaccine was unsuccessful, compounds made by Koch are the basis for TB test used today. Over the course of his career he was often called on to study or confirm others conclusions on most major pathogens of the day including malaria and typhus. Students trained by Koch are credited with either discovering or producing foundational work on most major 20th century pathogens including bubonic plague, diptheria, thyphoid and others. One of his most significant contributions however is his postulates on how to identify the correct pathogen for a disease. Koch’s postulates are still considered the gold standard in pathogen identification today. While molecular biology can tell us a great deal about newly discovered viruses in particular and give us presumptive identification of pathogens, we must resist taking the short and relatively easy path to identification. The last major new pathogen that I know was confirmed with Koch’s Postulates is HIV, though I’m sure there are others more recently. Koch’s postulates were developed when bacteria were the only known pathogens. Find the same bacterium in every case of disease. Culture it from patients and maintain it in pure culture. Infect a test animal with the bacterium and get the same disease. Isolate the bacterium from the test animal in pure culture. Each of the first three postulates can be a challenge. We now know that pathogenic bacteria often cause sub-clinical infections or become normal flora. In other words, they exist in people with no signs or symptoms of infection. Still it should be present in all cases of observable disease. Getting the culture conditions and nutrient mix right make culture conditions very difficult for some pathogens. For viruses, a cell-based culture system has to be devised. Likewise the third postulate requires the discovery of a test animal that can be infected by the pathogen. This can be especially challenging for viruses. Confirmation of HIV as the cause of AIDS was delayed by several years, if I recall correctly, because of the lack of suitable test animals. It is unethical to test on humans and only a few primate species are capable to becoming infected. Naturally many other test animals were tested before the medical community accepted that there was no other choice than these primates. For those who speculate that anthrax was the agent of the Black Death, note that people like Yersin and Kitasato, who trained with Koch, would surely have known the difference between anthrax and plague! Their mentor Koch built his career on his discovery that Bacillus anthracis is the cause of anthrax.